PocketBook A 10’’ is ready to meet any needs in reading, entertainment and work. PocketBook A 10’’ is based on Android 2.3.5 Gingerbread. Besides, PocketBook International’s unique know-hows were implemented in this model, such as the original interface, a library and a video player. The color multi-touch 10 inch display is a unique face of PocketBook A 10’’. The exclusively comfortable 4х3 form factor is especially designed for reading, work and fun, as well as for watching HD video. The display solution at 1024х768 pixels and 262,000 color shades rendering allow enjoying the images and video in full. It is easy to read with PocketBook A 10’’ owing to optimal combination of fonts and background color. Based on the special research data, their best shades were defined to provide the best reading experience at TFT display. High-sensivity multi touch screen enables fast and effective work with applications. PocketBook A 10’’ control panel is easy to deal with for the most comfortable reading. Apart from usual buttons such as Home, Menu, Back and Search, two special paging buttons make it different from the standard panels of Android based devices. All the buttons are softly backlit. There is a volume regulator at the left side panel. The generated sound is powerful and clear. The lithium-polymer built-in accumulator capacity is 6600 mAh. •	6 hours of non-stop video watching. 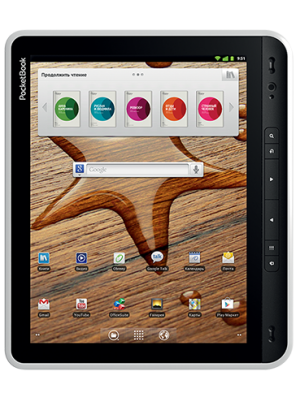 PocketBook A 10’’ has built-in Bluetooth 2.1 for information exchange. Internet connection is being realized via Wi-Fi 802.11 (b/g/n). Optionally, the models are equipped with a 3G module and a SIM-card slot to enable 3G connection. PocketBook A 10’’ is based at TI ОМАР 3621 processor (1GHz). It creates the productive environment which is necessary for multifunctional applications to work effectively. Additionally, 512 MB of operative memory contribute to high performance. The highest demands to productivity are met in PocketBook A 10’’. With this device, you can simultaneously watch video, listen to the music, surf the Internet and read books. Like all PocketBook devices, PocketBook A 10’’ supports all the e-book formats. PocketBook A 10’’ supports 11 text formats: PDF (ADOBE DRM), EPUB (ADOBE DRM), PDF, EPUB, FB2, TXT, DJVU, RTF, HTML, DOC, DOCX, for graphic formats - JPEG, BMP, PNG, TIFF, three video formats - AVI, MKV, MP4 and two audio formats - MP3, WAV. 44 pre-installed ABBYY Lingvo dictionaries will help to define the meaning of foreign words while reading. The device supports Text-to-Speech converter which can read a book to you in 5 languages of 27 available for download at the PocketBook International site.